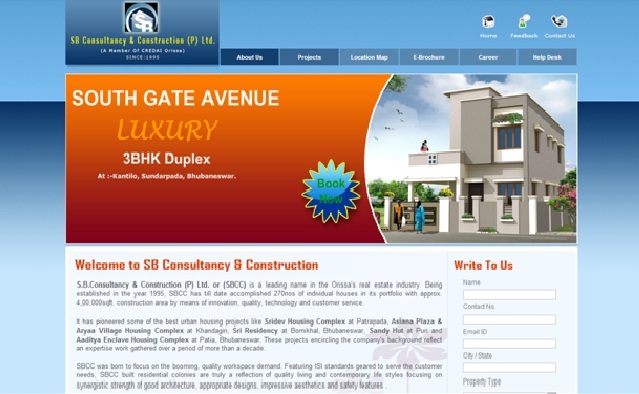 SB Consultancy and Construction is a leading infrastructure development company in the temple city Bhubaneswar, Odisha. This company is started in the year 1995 with the aim of to provide Quality services and Best customer care. This company is committed to provide affordable residential projects like apartments, simplex, duplex, and housing lands with affordable prices in the suitable locations of the city. This company actively delivers quality construction, best locations, and 24x7 customer’s support. This company is working with the help of experienced contractors, supervisors, architects, sales and marketing managers to give proper information’s to their esteemed customers. This project is located at Kantilo, Sundarpada, Bhubaneswar, Odisha. This project is divided into two categories such as South Gate Avenue Luxury and South Gate Avenue Premium includes 109 beautiful houses. The features of this project are 30’ main and 25’ inner roads, individual tank, soak pit and sump, community hall, play ground, jogging track, guest room, open parking space, 24 hrs water supply, generator back up and security, shopping complex and temple. We are the best Leading Construction Companies in Dubai. People looking for construction and contractor company in Dubai can contact us.